The New York Dolls are one of those bands that you always remember the first time you heard them. I knew of the name from Guns N' Roses' Spaghetti Incident? album where they covered the Dolls' Human Being. So at the ripe old age of 15 I found a copy of their first album for $5.99 at my local Newbury Comics store and the rest is history. I loved it right away. It was too femine to be punk but too scary and heavy to be glam and it had great production courtesy of Todd Rundgren. Naturally, when I found this DVD from MVD I had to give it a shot. Featuring several live performances cut together to show the band playing their best songs, Lookin' Fine on Television is a dream come true for hard rock fans. This short lived, but much loved band rocked harder than anyone else at the time and its a real treat this stuff even exists - mainly because there is so little footage of them out there. Between the songs we get some super rare interviews with the band members, including a long interview with singer David Johansen. 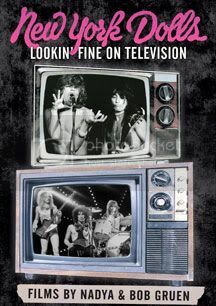 Lookin' Fine on Television is a great slice of rock history and an important document for music fans. The footage is a little rough but that's only fitting for the Dolls. Nadya and Bob Gruen were well known photographers from the 70s early NY punk scene and they capture the band in all of their glory. My favorite part of the DVD is David Johansen interviewing guitarist Johnny Thunders shortly after the band dissolved. You can see them talking about Thunders' (at the time) new band The Heartbreakers just as Johansen had started his solo career. This disc should be cherished by fans of the band and is a great introduction to anyone who has never heard them.